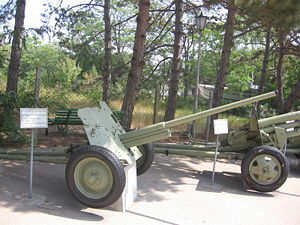 M-42 in Museum on Sapun Mountain, Sevastopol. M-42 was a 45-mm Soviet light semi-automatic anti-tank gun. Its full official name is 45-mm anti-tank gun model 1942 (M-42) (Russian: 45-мм противотанковая пушка образца 1942 года (М-42)). These guns were used from 1942 until the end of World War II. The M-42 was developed by the No. 172 Plant in Motovilikha as an upgrade of the 45 mm anti-tank gun M1937 (53-K). The gun received a longer barrel (L66, 20 calibers more than the previous one, so it was a 45 mm/L66), shells with more powerful cartridges, and a thicker shield (7 mm instead of 4.5 mm), but of hinged construction as a need for reduced profile, requiring crews to kneel while serving the weapon. Some minor changes were also introduced in order to speed up production. These guns were used from 1942 until the end of World War II. In 1943, due to its insufficient anti-armor capabilities against new German tanks such as Tiger, Panther and Panzer IV Ausf H, the M-42 was partially replaced in mass production by more powerful 57 mm ZiS-2 anti-tank gun. The M-42 remained in production however, as it was quite effective against lighter vehicles and could pierce the side armour of Panther and Panzer IV Ausf H. Fragmentation shell and canister shot gave the gun some anti-personnel capability. Mass production of M-42 ceased in mid-1945. The total number of guns produced is 10,843. During the second half of World War II, some Romanian anti-tank platoons were each armed with four captured 45 mm M1942 pieces and three 75 mm guns, either Pak 40 or Reșița Model 1943. A total of 709 guns had been captured by the Romanian Army by 1943, with 486 of them being repaired for Romanian use during the year. ^ a b c d e f g h i Foss, Christopher (1977). Jane's pocket book of towed artillery. New York: Collier. p. 13. ISBN 0020806000. OCLC 911907988. Koll, Christian (2009). Soviet Cannon - A Comprehensive Study of Soviet Arms and Ammunition in Calibres 12.7mm to 57mm. Austria: Koll. p. 423. ISBN 978-3-200-01445-9. Wikimedia Commons has media related to M-42 45 mm anti-tank gun.